Pope Benedict…Work Towards Ending Racism! 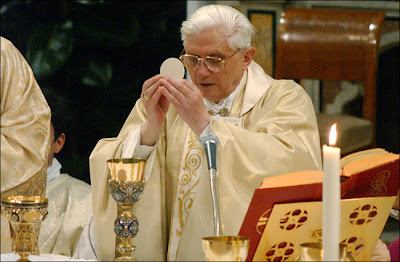 Earlier today the secular press reported that Pope Benedict XVI exhorted faithful Catholics to actively work against the enduring plague of racism throughout the world. The elimination of cultural, ethnic, racial and social racism is perhaps the most difficult eradication to achieve in our multicultural and multiethnic global community. Perhaps the best manner to begin to eliminate this pervasive and enduring barrier towards human harmony is to start within the confines of our own Catholic Church. It seems there is always a new title cropping up on the diocesan level, some variants of titles include, Office for Black Catholics, Office for Hispanic Catholics, Office for Catholics with Disabilities, Office for Itinerant and Migrant Worker Catholics and so on. Then the titles develop spin off ministries that are associated with the specific cultural or ethnic distinction the office is intended to resolve. It never ceases to amaze me that the development of all of these specialized offices and various vicariates doe not completely embrace the mandate of Jesus in the Joannine Gospel, â€œThat they may be one!â€ As a result especially in the United States there has evolved a â€œsort of â€œethnic racism that exists under the false appearance of enhancing cultural diversities. What happens then is this; the Catholics of Latino, Asian and Black are segregated from participation in an open and accepting liturgical celebration because there is a bias that constantly suggests Catholic cannot worship as a spiritual plurality. In the 19th and 20th centuries in the United States this overt example of racism existed in what formerly were called â€œnational parishes.â€ These parishes isolated the Italians, Irish, Polish, German and multiple other cultural groups into micro parishes of ethnic and cultural isolation. Often as was the case, individuals that did not share the heritage of the â€œnational parishâ€ were often afraid or even advised not to attend the Sacred Liturgy because theyâ€¦â€did not belong,â€ to that particular group. As a result there are still remnants of discrimination and ethnic racism that exist against various Indo-European cultures that immigrated to the United States during the great migration of the 19th and early 20th centuries. Ethnic and racial Catholicism under the appearance of providing cultural and ethnic havens for immigrants quite frankly resulted in the inability of Catholics to accept the cultural diversity that is incumbent to faith in Jesus Christ. Additionally, in the past the segregation was a terrible illustration and appreciation of the totality of the Body of Christ as a holistic and functioning theological body. If indeed we want to work towards an end to racism in the Church, we need to eliminate the segregation that exists when offering pastoral and sacramental ministry to â€œso-calledâ€ special groups that exist within the Catholic Church. All of us that profess faith in Jesus Christ are called to be totally equal and important members of the Mystical Body. If indeed we want to actively believe and practice this deeply rooted theological reality of Eucharist, then the pastoral and catechetical emphasis within the Church should work towards the elimination of all of these divisive special ministries. The magnificent historical and cultural heritage of the Liturgy of the Eucharist should stand as the pinnacle example of our theological plurality in its sacramental application. The opportunity to evangelize and catechize all cultural and ethnic groups exists in the transcendent nature of the Eucharistic species. Our celebration of Eucharist as a diverse but yet unified Church of faithful believers offers an equal opportunity for all members of each cultural and ethnic sector to realize sanctification and salvation through the graced sacramental activity of the Catholic Church. Pope Benedict is absolutely correct in the universal call to Catholics to end the ugly and unnecessary views of social and cultural racism that exist in our world today. Already in place is the most effective conduit towards the success of such a â€œGospel-friendlyâ€ goalâ€¦namely the inclusion of all peoples in Catholic prayer and sacraments without the ethnic and racial specific special applications of the Churchâ€™s Sacred Ministry. As the modern world of the 21st century continues to shrink in its size due to the revolutions realized in science and technologies, our theological appreciation for our common humanity needs to more deeply establish itself through out sacramental rituals and practical pastoral applications of both Word and Sacrament as effective instruments of Godâ€™s grace to end global racism and discrimination. We are truly one in the Spirit, and One in the Eucharistic Lordâ€¦our institutional structure of Catholicism should reflect this theological and sociological reality as well. 1 user commented in " Pope Benedict…Work Towards Ending Racism! " I agree 100%. Well said.